What exactly happens when lightning strikes occur is still unclear. Using high-resolution data from the LOFAR radio telescope, an international team of researchers has now discovered needle-shaped structures that could bring light into the discharge processes. Important foundations for the measurement of flashes with the world's largest antenna array were laid at the KIT. What lies behind the previously unknown needles has now been published in the journal "nature". When ice crystals collide in a thunderstorm cloud, they charge electrically. Winds can separate the crystals, so that one part of the cloud is positively charged, the other negatively. If the resulting electric field becomes too large, a violent discharge occurs, which we perceive as lightning and thunder. The discharge begins with a small volume of air in which electrons separate from the air molecules. This ionized air, also called plasma, is electrically conductive. The plasma spreads out as branched channels until it hits the earth and the electrical voltage of the clouds discharges as lightning. The exact processes in these channels up to the recent discovery of the "lightning needles" are revealed by high-resolution data derived from radio signals of lightning, measured with the Dutch radio telescope LOFAR (Low Frequency Array), in which the KIT participates. "Thanks to the high spatial and temporal resolution of LOFAR, we can investigate the formation of flashes in a completely new order of magnitude, right down to the primary processes," explains Dr. Brian Hare from the University of Groningen and first author of the publication in the journal "Nature". LOFAR consists of thousands of antennas spread across Europe - an array primarily developed for astronomical observations, but now also used to measure cosmic rays. The signals triggered by the cosmic particles in the atmosphere are buffered at the individual antennas and then read out for various analyses. "This technology, which is being advanced at KIT, is now also being used to measure and store radio signals emitted by lightning," explains KCETA-scientist Dr. Tim Huege from the Institute of Nuclear Physics at KIT and a member of the "LOFAR Cosmic Ray Key Science Project". Slow motion of a developing lightning, which in reality lasts 0.2 seconds and spans about 5 kilometres in all directions. The yellow dots show current radio signals, the white dots the past ones for illustration. Close-up of a plasma channel that in reality lasts 0.1 seconds and spans 400 meters. One of the newly discovered needle-shaped structures is marked in red. Brian Hare, Olaf Scholten et al. Needle-like structures discovered on positively charged lightning branches. Nature, 18 April 2019, https://www.nature.com, DOI: 10.1038/s41586-019-1086-6. PhD students with the first antenna for the AugerPrime radio upgrade. Young scientists cheer after installing the first antenna for the AugerPrime radio upgrade! Also on site: KSETA PhD student and member of the Helmholtz International Research School (HIRSAP) Felix Schlüter (second from left). The radio upgrade, which is part of the AugerPrime upgrade, is a very important part of the future research of the Pierre Auger Observatory by adding array-based composition sensitivity for large zenith angles, for which the scintillator upgrade is not effective. Having good composition-sensitive information up to very large zenith angles is crucial for composition-improved anisotropy studies and adds to the overall aperture of the observatory. A deployment crew sets up the particle detector at the remote site of the Murchison Widefield Array radio telescope. A trial detector for studying cosmic rays has been set up alongside the Murchison Widefield Array (MWA) at the Murchison Radio-astronomy Observatory (MRO) in Western Australia. This 'proof of concept' detector is the first step in developing a set of detectors for the low-frequency Square Kilometre Array (SKA1-low) telescope, which is to be built at the MRO. In the longer term, these kinds of detectors will be used to trigger the MWA to capture the radio pulse associated with an incoming cosmic ray, a synergy of radio astronomy with astroparticle physics. The used particle detector is based on a donation from the dismantled cosmic ray experiment KASCADE at KIT. Prof. Ulrich Husemann (Institute of Experimental Particle Physics) was elected to the board of directors of the German Physics Society (DPG) for the first time. The DPG is the world's largest physics society. The board of directors is the "parliament" of the DPG and especially responsible for strategic decisions. Congratulations! For her presentation at the conference "11th International Workshop on Top Quark Physics 2018", Denise Müller, PhD student at the Institute of Experimental Particle Physics (ETP), was awarded the prize for the best young scientist presentation in front of 130 participants. The 11th edition of the conference "International Workshop on Top Quark Physics" took place in Bad Neuenahr from 16 to 21 September. This annual conference brings together experts from theory and experiment who deal with the heaviest of the six quarks, the top quark. Traditionally, the Young Scientist Forum gives young scientists the opportunity to show their work in short presentations. Denise Müller reported on the measurement of the single top quark production in the t channel with data from the CMS experiment, where she does research together with other colleagues from ETP under the supervision of Dr. Thorsten Chwalek. While top quarks are generated in pairs with top antiquarks in strong interaction, the generation of single top quarks takes place in weak interaction, the secrets of which have not yet been revealed in detail. In Denise Müller's analysis it was possible to measure the relationship between the production probabilities of individual top quarks and individual top antiquarks with unprecedented precision and thus to make statements about the inner structure of the proton. The KIT is involved in the CMS experiment with a ninety-member working group headed by Prof. Thomas Müller. In 2012, the long-sought Higgs particle was also discovered there. At the meeting "Astroparticle Physics in Germany - Status and Perspectives", which took place in Mainz this year, three present and former members of KCETA/KSETA were very successful. At the poster session with 33 posters, the KCETA member Dr. Wonqook Choi and the two former KSETA doctoral students Dr. Anne Zilles and Dr. Felix Werner were each given a poster award. Congratulations! Visualisation of the detector signals of a candidate of a collision event in which a Higgs boson decays into a bottom quark-antiquark pair. A key property of the Higgs boson, the elementary particle discovered in 2012, has been observed at the CMS experiment at the CERN LHC: the decay into further elementary particles, the bottom quarks. Physicists at the Institute for Experimental Particle Physics at KIT contributed with their measurements to this result, which represents another confirmation of a central prediction of the standard model of particle physics. It follows the observations of the Higgs boson‘s interaction with top quarks and tau leptons, which has recently been achieved with leading contributions by KIT physicists. Frank Schröder, KCETA Scientist at KIT and Assistant Professor at the University of Delaware, USA, receives an ERC Starting Grant for his research on the sources of high-energy cosmic rays from the Milky Way: The European Research Council will fund his project with 1.6 million euros for five years. Frank Schröder and his colleagues at the Institute for Nuclear Physics at KIT have made significant progress in radio technology for the detection of cosmic rays. This enables also the search for high-energy photons associated with the production of charged cosmic-ray particles. Visualisation of the detector signals of a ttH candidate event. A new way to produce a Higgs boson, the elementary particle discovered in 2012, has been observed for the first time at the CMS experiment at the CERN LHC. Here, the Higgs boson is produced together with two top quarks, the heaviest known elementary particles. Physicists at KIT in the group of Prof. Husemann had major contributions to this result. The Council for Research and Promotion of Young Scientists (CRYS) certifies the Helmholtz Young Investigator Group "Analysis of KATRIN Data to Measure the Neutrino Mass and Search for New Physics" to be extremely successful in its work. One focus of the Young Investigator Group led by KCETA PI Dr. Kathrin Valerius is to develop strategies and methods for analysing the neutrino mass data collected during measurement operations. In the second phase of its work programme, the research group will use the data to search for completely new physical phenomena. The Young Investigator Group was established in 2014 and is scheduled to run for five years. Kathrin Valerius received the status of Associate Fellow at the KIT Faculty of Physics as group leader and has been spokesperson of the Young Investigator Network (YIN) since 2017. During the KIT Annual Celebration on April 19, 2018, Professor Alexander Wanner, vice president for higher education and academic affairs, has awarded the Faculty Teaching Awards 2018. Among this year’s winners was KCETA researcher Ulrich Husemann (Institute of Experimental Particle Physics). The 10000-euro award is given to lecturers of the 11 KIT departments for outstanding teaching performance. 11. Dezember 2017 – "Physics World Top Ten Breakthrough of 2017"
Ever since the existence of cosmic rays with individual energies of several Joules was established in the 1960s, speculation has raged as to whether cosmic particles of mean energy of 2 Joules are created in our Milky Way or in distant extragalactic objects. In a paper that was published in Science on 22 September 2017, the Pierre Auger Collaboration reported observations demonstrating that cosmic rays with energies a million times greater than that of the protons accelerated in the Large Hadron Collider come from much further away than from our own Galaxy. Earlier this year the physics magazine physicsworld.com reported about that paper, which was now chosen to be included in the “Physics World Top Ten Breakthroughs of 2017”. • general interest to all physicists. At the November meeting of the members of the Pierre Auger Observatory in Malargüe, Argentinien, Dr. Ralph Engel was elected spokesperson of the international collaboration which consists of 89 institutes in 17 countries. Ralph Engel is principal investigator of the KSETA graduate school und acting director of the Institute for Nuclear Physics (IKP) at KIT. Dr. Teppei Kitahara, postdoc at KIT's Institute for Nuclear Physics, has received the `Young Scientist Award 2018' of Physical Society of Japan in the category `Theoretical Particle Physics'. The laudation mentions three publications which he has written at KIT. They deal with direct CP violation in the decays of a Kaon into two pions. CP violation means that fundamental laws of nature treat particles differently from antiparticles. While direct CP violation in the mentioned decays has been observed almost 20 years ago, the theoretical interpretation has become possible only recently, thanks to advances in computer-based calculational methods. Teppei Kitahara and his collaborators have shown that the measured value, which deviates from the prediction of the Standard Model, can be explained in supersymmetric theories. The research line on supersymmetry has been founded in 1973 by Prof. Julius Wess (Universität Karlsruhe) und Prof. Bruno Zumino (CERN). The updated version of KCDC release NABOO is available. For this new update NABOO 2.0 there were added CORSIKA simulations for six different High-Energy Hadronic Interaction Models from three model families (QGSjet-II-02 and QGSjet-II-04; EPOS-1.99 and EPOS-LHC ; SIBYLL-2.1 and SIBYLL-2.3), separately available for the three detector components KASCADE, GRANDE and CALORIMETER. Ever since the existence of cosmic rays with individual energies of several Joules was established in the 1960s, speculation has raged as to whether cosmic particles of mean energy of 2 Joules are created in our Milky Way or in distant extragalactic objects. In a paper published in Science with the title „Observation of a Large-scale Anisotropy in the Arrival Directions of Cosmic Rays above 8×10^18 eV“, the Pierre Auger Collaboration reports observational evidence demonstrating that these cosmic rays come from much further away than from our own Galaxy. More than 400 scientists from 18 countries work together in the research collaboration. Scientists of KCETA are significantly involved both in terms of science and project office, with primary responsibility for the development of the fluorescence telescopes. Congratulations to KSETA PhD student Nils Faltermann for the award of his poster at the International Workshop on Top Quark Physics (TOP2017), which took place from September 17 to 22 in Braga, Portugal. 139 participants discussed the latest experimental results and developments in theoretical calculations in the field of top quark physics. In addition to numerous plenary lectures, there was also a poster session, which gave young scientists in particular the opportunity to present their results to a broad audience. The three posters with the most votes of the conference participants were awarded prizes at the workshop dinner. A new funding instrument is being launched in German-Russian research cooperation. The Helmholtz Association and the Russian Science Foundation (RSF) have selected the first six joint research groups for their "Helmholtz-RSF Joint Research Groups" funding programme, including the "Karlsruhe-Russian Astroparticle Data Life Cycle Initiative". In astroparticle physics, scientists must be able to exchange their highly detailed observations in order to investigate and better understand complex processes in the universe. The aim of the scientists at Lomonosov University Moscow and KCETA is to make a broad spectrum of high-energy cosmic radiation data publicly available. To this end, the researchers involved will establish a joint data portal of two independent observatories. On this year's ICRC conference in Busan, Korea, not only Frank Schröder was given the IUPAP Young Scientist Award 2017, but also KCETA young scientist Ewa Holt received a Best Poster Award of ICRC 2017. Three outstanding posters were selected out of a total of about 600 posters. Congratulations! The International Cosmic Ray Conference, or ICRC, is a physics conference organized biennially by the Commission C4 (Astroparticle Physics) of the International Union of Pure and Applied Physics (IUPAP) since 1947, where physicists from the whole world present the results of their research in Astroparticle Physics. With the participation of KCETA scientists the European project SENSE aims to coordinate research and development efforts in academia and industry in low light-level sensoring. It is funded by the European Comission Future and Emerging Technologies Coordination and Support Action. Besides KIT the project consortium consists of the partners Deutsches Elektronen Synchrotron, Université de Genève and Max Planck Institute for Physics in Munich. In collaboration with an Expert Group a European R&D roadmap towards the ultimate low light-level (LLL) sensors will be developed and will be presented in October '17 at the LIGHT workshop. to frame up a technology training session that can be implemented in any existing summer school. Dr. Frank G. Schröder, young scientist at KIT in the field of experimental astroparticle physics, was chosen to receive the Young Scientist Award 2017 of the IUPAP (International Union of Pure and Applied Physics). This award recognizes his outstanding contributions to cosmic rays physics, in particular to the development of radio detection of high-energetic cosmic rays. The award will be presented at the ICRC (International Cosmic Ray Conference) in Busan, Korea on July 12, 2017. The pioneering work was carried out by E. H. M. Heijne working at CERN, and R. Klanner and G. Lutz at the Max-Planck-Institute of Physics in Munich. Later R. Klanner took positions at Hamburg University and DESY. Robert Klanner has been an Emeritus Professor since 2010. Robert Klanner was awarded the Julius Wess Award 2016. Just in time for the open day 2017 a new info panel on the KASCADE / KASCADE-Grande experiment was installed at the southwest corner of the former KASCADE detector field at Campus Nord. Between February 1994 and January 2013 the air shower experiment KArlsruhe Shower Core and Array DEtector (KASCADE) investigated very successfully the properties of cosmic rays, with many KCETA scientists involved. The KASCADE data are available for the public at the 'KASCADE Cosmic Ray Data Centre' (KCDC). The LHC particle accelerator at the European particle physics laboratory CERN near Geneva has resumed operation. A new silicon pixel detector was installed in the CMS experiment during the winter break. Physicists, engineers and technicians from the Karlsruhe Institute of Technology (KIT) have made important contributions in many areas. How can one "see" the elementary particles that arise in the particle collisions at the LHC? The first step is a silicon pixel detector, which is operated only a few centimetres away from the collision point and detects the traces of charged particles. At the CMS experiment, one of the huge particle detectors at the LHC, the silicon pixel detector has now been replaced as planned by a new and improved version. The new detector is lighter than its predecessor, has 124 million pixels, almost twice as many channels and is equipped with more powerful readout chips. With the new detector, the CMS experiment is well equipped for the expected increase in performance of the LHC in the coming years. The new detector was developed and built by an international team in which KIT, RWTH Aachen University, the University of Hamburg and DESY are involved. Nearly 20 % of the detector was built at KIT. KIT Project Manager Ulrich Husemann: "We have successfully set up and operated a production line for the pixel detector in Karlsruhe. In the construction of the detector, we attached great importance to the highest quality, and this has paid off. At the same time, our project has trained young scientists and students who are now familiar with the latest methods in the chip industry". The detector parts were constructed in cooperation with the Institute of Experimental Nuclear Physics and the Institute of Process Data Processing and Electronics and thoroughly tested. KIT physicists and technicians were also present at the installation of the detector at CERN. Another group at KIT is currently working on the high-precision determination of the orientation of the new detector in order to achieve the required measurement accuracy. Now the KIT team is looking forward to the first particle collisions in the new detector. Particle researchers from KIT and the University of Heidelberg are combining their joint research activities with national and international partners in the Neutrinomasse Network and signed a corresponding Memorandum of Understanding. Neutrinos play an important role in the investigation of the origin of matter and in the design of visible structures in the cosmos. Their mass, which must be more than a billion times smaller than that of a hydrogen atom, is an important but still imprecise parameter. To measure this, researchers in Karlsruhe and Heidelberg, together with their national and international partners, are developing extremely precise sensors and detectors for particle physics experiments such as KATRIN and ECHo. "We are now setting the course for Germany to remain a Mecca of neutrino research for a long time to come," says Guido Drexlin from KIT, one of the two speakers of KATRIN - the KArlsruhe TRItium Neutrino Experiment. "The technologies developed by KATRIN and ECHo will be relevant to the whole field of particle physics." "The cooperation between the experiments from Karlsruhe and Heidelberg will increase our impact and international visibility," emphasises Christian Enss from the University of Heidelberg and spokesman of the DFG research group ECHo - the Electron Capture Holmium Experiment. Prof. Robert Klanner, University of Hamburg und DESY, was chosen to receive the Julius Wess Award 2016. The presentation of the award took place on March 3rd, 2017. In a festive event Prof. Klanner received the award from Prof. Oliver Kraft (Vice President for Research, KIT), accompanied by a very appreciated talk by Prof. Rohini Godbole from the Indian Institute of Science, Bangelore ("Higgs-Boson and the Physics beyond the Standard Model"), an introduction to the KIT Center KCETA by Prof. Marc Weber (Scientific Spokesperson of KCETA) and the laudatio by Prof. Thomas Müller (KIT). After the presentation of the award Prof. Klanner gave a highly esteemed talk on "Silicon Detectors: From the early days to the LHC and XFEL". The Ensemble Claribel pleased the audience with musical contributions by Mozart, Paganini and Brahms. With great pleasure we nominated Robert Klanner for the 2016 Julius Wess Award in recognition of his fundamental contributions to the development of silicon microstrip detectors, in particular for achieving for the very first time the resolution required to reconstruct secondary vertices from the decay of heavy-flavoured hadrons. With this development Robert Klanner initiated the culture of flavor-tagging in particle physics. Robert Klanner (together with Gerhard Lutz and the late Josef Kemmer) worked in the early 1980s on the development of a Silicon strip detector using the planar process developed at the Semiconductor Laboratory of MPI Munich. In the paper “A silicon counter telescope to study short-lived particles in high-energy hadronic interactions”, Nucl. Instrum. Meth. 205 (1983) 99, Klanner et al. describe for the first time a working detector with 5 μm spatial resolution as required for secondary vertex reconstruction. Soon after, in the paper “Silicon detectors with 5 micrometer spatial resolution for high- energy particles”, Nucl. Instrum. Meth. 217 (1983) 224, they showed the first reconstructed secondary vertices from charmed meson decays. The work was the founding block for the rapid development of micro-structured silicon detectors in High Energy Physics, for secondary vertex tagging and nowadays also for large-area tracking detectors, in particular the LHC detectors ATLAS and CMS. Silicon tracking detectors are present in any modern particle physics experiment. Without this detector type many major discoveries and important measurements would not have been possible, among them heavy quark physics at LEP, the discovery of CP-violation at the B- factories and the discovery of Bs oscillations. One of the most important discoveries of the past 20 years, the top quark at the Tevatron, was only possible through the employment of secondary vertex tagging. Also for the future of High Energy Physics this kind of instrumentation will remain invaluable, such as for searches for new particles and for studying the Higgs boson in the b decay channel. As such, silicon microstrip detectors revolutionized the field of experimental High Energy Physics to at least the same extent as the invention of multi-wire gaseous detectors by G. Charpak and F. Sauli in the late 1960s and 1970s. Robert Klanner continued to work on silicon detector development with continuously strong impact on the field until today, including his studies on fundamental sensor properties like radiation effects, and helped pave the way to physics at the next generations of experiments. Beyond his seminal work in instrumentation, Robert Klanner also held several very important management positions. He started his career in the early 70-ies and obtained his PhD in Nuclear Physics in Protvino, USSR. He then accepted a postdoc position and later an Assistant Professorship at the University of Illinois, Urbana, and joined the Max-Planck- Institute in Munich in 1975. In 1984 he moved to DESY to contribute to the construction of the HERA experiment ZEUS. Robert Klanner was spokesman of the Na11 experiment which discovered Open Charm in fixed-target events by means of silicon strip detectors. In 1996 he became Professor at the Universität Hamburg. From 1999 to 2005 he served as the Research Director of DESY. For many years Robert Klanner was project leader of the ZEUS calorimeter, one of the most powerful and innovative hadron calorimeters at the time and a defining subdetector of the ZEUS experiment. He also served as the physics coordinator and spokesperson of ZEUS. Robert Klanner had been a long-term member of the Vorstand of the German Physical Society DPG and a co-editor of the scientific journal “Nuclear Instruments and Methods in Physics Research A”. Since February 3rd, the new KCDC web portal NABOO is available. For this new release not only the amount of data was increased by a factor of more than 3, but also there was added a new detector component (GRANDE), and the whole DataShop backend was rebuilt. The DataShop is now organized as a plugin system, based on a newly written software package which will also be made available for public usage. In 2016, five outstanding international scientists, including KSETA lecturer Gustavo Romero, Professor of Relativistic Astrophysics, Faculty of Astronomy and Geophysics, University of La Plata, Argentina, received this award in the annual second round of the „Helmholtz International Fellow Award“. "I congratulate the award winners and look forward to working with them in the future," says Otmar D. Wiestler, President of the Helmholtz Association. "The fact that we network internationally with top researchers is an important part of our strategy. We cooperate worldwide with outstanding partners and research institutions." Many winners of the Helmholtz International Fellow Award have already worked closely with Helmholtz Centres. The award is intended to help the researchers network even more intensively with the Helmholtz Association, strengthen existing collaborations or initiate new ones. In addition to the prize money of 20,000 euros, they will receive an invitation to a flexible research stay at one or more Helmholtz centres. "The Fellows are also important ambassadors," says Wiestler. "They can provide decisive impulses for cooperation between their institutions and the Helmholtz Association." The prizewinners are selected by the Helmholtz Executive Board and the candidates are nominated by the Helmholtz Centres - Gustavo Esteban Romero has been nominated by the Karlsruhe Institute of Technology (KIT). The esteemed KSETA lecturer is also involved in the double doctoral program DDAp of the Faculty of Physics of the KIT and the Institute of Technology in Detection and Astrophysics (ITeDA) at the Universidad Nacional de San Martin (UNSAM) in Buenos Aires, Argentina. The Alpha-Magnet-Spectrometer (AMS) has been orbiting the Earth at an altitude of 400 km on the International Space Station (ISS) for 5 years. With a construction time of 15 years, a cost of 1.5 billion dollars, an instrumented volume of 60 m3 and a weight of 7 tons, it is the largest basic research experiment on the space station. This unique measuring instrument was sent on its last flight of the Space Shuttle Endavour 2011 from the Kennedy Space Center. Since then, AMS has recorded 90 billion charged particles from cosmic radiation before they were absorbed into the Earth's atmosphere. This unique data set with a measurement accuracy on the percentage level allows us to draw conclusions about the highest energy processes in our galaxy and thus also provides information on the answers to the great questions of modern physics. On December 8, the speaker of the AMS Collaboration, the Nobel Prize winner Prof. Ting from MIT summarized the results at CERN. In Germany, working groups of the RWTH Aachen University, the Karlsruhe Institute of Technology and the Research Centre Jülich are involved. These activities are coordinated by Prof. Schael, RWTH Aachen and funded by DLR. Research Centre Jülich and RWTH Aachen University are working together on the project within the framework of the Jülich-Aachen Reserach Alliance (JARA). Dr. H. Gast coordinates the analysis activities for this group, Dr. I. Gebauer heads the Karlsruhe group. The results of AMS have many surprises in store for the experts. They clearly show that our understanding of the generation, acceleration and transport of cosmic radiation from the sources to our solar system to the AMS experiment is incomplete. Until now it was assumed that these particles were generated and accelerated within our galaxy in supernova explosions and heavy stars. The precision of the AMS data now shows for the first time in which direction the previous models must be extended (see Figure 2). A very small part of cosmic radiation consists of anti-matter particles. These are therefore particularly sensitive samples for new and unexpected processes. AMS observed at high energies both more positrons and more anti-protons than expected. The interactions of dark matter particles in our galaxy could explain both. But to be sure, this interpretation would need independent confirmation with other approaches, such as proof of the production of these dark matter particles at the LHC accelerator at CERN in Geneva. Helium is the second most abundant element in the universe after hydrogen. AMS has recorded 3.7 billion helium events in the last 5 years. One of the great open questions in physics is why we do not observe anti-helium in the universe. If the universe was created from nothing by a Big Bang, there must have been as much matter as antimatter in the beginning. Therefore, AMS also searched for anti-helium nuclei in its data. The observation of a single anti-helium nucleus in cosmic radiation would already fundamentally change the entire world view of modern physics. As Mr. Ting has reported at CERN, AMS has observed several anti-helium candidates whose mass is compatible with 3He. However, the rate of these events is so low that AMS was previously only able to investigate the question of whether these few events could not also be traced back to other causes with the help of complex computer simulations. These invoices have taken more than 10 million hours of computing time on a worldwide network of mainframes. The lion's share of more than 50% was taken over by the computer centre of Forschungszentrum Jülich. In these simulations there is no explanation for the observed anti-helium candidates. But computer simulations are always only an approximation to reality. Therefore, one of the priorities of AMS Collaboration is to develop methods to verify this result solely on the basis of the own measurement data. The precision of the AMS data has provided many important new insights and thus heralded a new era in this field of physics. As always when new ground is broken in basic research, the results also raise questions that are only made possible by the new results. AMS will continue to measure cosmic radiation with unprecedented precision until the end of the life of the International Space Station. We can only be curious about the further findings. The Pierre Auger Observatory detects more muons from cosmic-ray showers than predicted by the most up-to-date particle-physics models. "The new results from the Pierre Auger Observatory put the muon excess on a firmer basis by making a tight connection between the telescope measurements and the signal on the ground. This finding suggests that the best models of hadronic interactions are missing something. One possibility is that they do not account for a process that keeps more energy in the hadronic component; for example, a higher production of baryon-antibaryon pairs. Another option is that the physics of strong interactions changes at energies beyond those tested at the LHC." October 14, 2016 - Neutrino sacle KATRIN celebrates "First Light"! As the most precise balance in the world, KATRIN is to determine the exact mass of the smallest particle of matter, the neutrino, a subject area that was awarded the Nobel Prize in Physics last year. An important step on the way to measurement operation is the "First Light", i.e. when the detector "sees" electrons for the first time, which were guided through the entire 70-meter-long system. The final preparations for the KATRIN plant began at 3:30 p.m., surrounded by numerous representatives of the press, with introductory words by project manager Professor Guido Drexlin, Professor Oliver Kraft, Vice President of the KIT for Research, Professor Ernst Otten, founding father of the experiment, Professor Blümer, Head of the Department of Physics and Mathematics at KIT, and Professor Hamish Robertson from the University of Washington. Finally, at 3.50 p.m., the festive joint press on the "red button" started the electron source and delivered the hoped-for screen signal of the "First Light" to great applause. Neutrinos play an important role in the investigation of the origin of matter and in the design of visible structures in the cosmos. Their mass, which must be more than a billion times smaller than that of a hydrogen atom, is an important but still imprecise parameter. The international experiment KATRIN will limit the neutrino mass with an accuracy that will be more than an entire order of magnitude better than before. Starting in autumn 2017, electrons from the beta decay of tritium, in which neutrinos play a major role, will be measured exactly. Even if the instrument does not yet perform at its best with the "First Light", this moment is an important functional test for scientists and engineers. The numerous system parts and components of KATRIN will interact for the first time. The 70-meter-long path of an electron through the entire experiment includes superconducting magnets and cold traps, gas-filled areas and vacuum, zones with temperatures below 4 Kelvin and with room temperature, whose operation must be optimally matched to one another. For the "First Light", a switchable electron source is used that uses a UV light source to strike suitable electrons from a gold-plated stainless steel plate, which hit the detector after a flight time of a few millionths of a second. The detector made of silicon semiconductor material has a diameter of about 125 millimeters and contains 148 pixels, which are arranged similar to a dart board and thus allow a spatial "view" into the world of KATRIN. In recent years, KATRIN researchers have solved numerous scientific challenges and entered uncharted technological territory in order to master the century-long task of "measuring the neutrino mass". For example, to keep a high voltage of 18 600 volts stable with an accuracy of 0.01 volts. Or the generation of an ultra-high vacuum, which corresponds to that on the moon's surface, in a gymnasium-sized world record volume of 1240 cubic metres. Around 150 scientists from 6 countries and 18 renowned institutions are involved in the KATRINE experiment, which has a budget of 60 million euros. The measurement of the neutrino mass in tritium operation is scheduled to begin in autumn 2017. The first interesting results on neutrino mass are expected as early as mid-2018. Then the measurement sensitivity of KATRIN will already be significantly better than that of all other tritium decay experiments of the last 3 decades combined. However, KATRIN only achieves the final, planned sensitivity after 5 calendar years of measurement time. The iron plates come from the Karlsruhe experiment KASCADE, which provided insights into cosmic radiation at KIT and its predecessor institutions for 30 years. The heart of the experiment, the hadron calorimeter, consisted of several layers of differently thick iron plates between which detectors were installed. After 30 years of successful measurement, the experiment has been dismantled in recent years. Now the panels are loaded for three weeks and transported to FAIR and GSI in Darmstadt on a total of 161 articulated truck trips. In the future, they will be used in one of the major experiments of the new FAIR particle accelerator to slow down and absorb the part of the ion beam that cannot be used for the experiments. James W. Cronin, American physicist and Nobel laureate, passed away on August 25, 2016 at the age of 84 years in Saint Paul, Minnesota, USA. With his passing, the scientific community has lost an outstanding and visionary physicist with a brilliant mind and great enthusiasm, but also a very special and highly valued person. His friendly character and his passion inspired many others. Throughout most of his scientific carrier Jim worked at the University of Chicago. Together with Val Fitch, he was awarded the Nobel Prize of Physics in 1980 for his pioneering work on the violation of CP symmetry in the decay of neutral kaons. After many years of successful research in particle physics (hyperon decay, pion-proton-scattering, production of muons, and more), Jim shifted the focus of his research to the investigation of high energetic cosmic rays. Together with Alan Watson, he conceived and designed the Pierre Auger Observatory, located close to Malargüe, Argentina. Jim Cronin was not only the driving force behind the construction of the observatory, but also in establishing the international collaboration for its operation. In the early days of collaboration building, he often visited us in Karlsruhe to involve the local scientists. He convinced the participating institutes IKP, ETP (former IEKP) and IPE to direct a significant part of their research towards this large-scale experiment. This commitment led to many highly recognized contributions to the observatory and to the physics of high-energetic cosmic rays. KIT owes a considerable part of its high standing in astroparticle physics to the interaction with Jim Cronin. In 2011, Jim Cronin was awarded an honorary doctorate by the KIT Department of Physics. With Jim Cronin’s passing, the astroparticle physics community and KIT have lost an exceptional scientist and a good friend. The University of Chicago invites colleagues to honor the life of Professor James Cronin and share with his family, friends, and colleagues memories of his great accomplishments. A Science Symposium will take place on the afternoon of Friday September 30th followed by a Memorial on the morning of October 1st ending with a luncheon. If you are interested please contact Angela V. Olinto (http://astro.uchicago.edu/people/angela-v-olinto.php). LHC collision event recorded with the CMS detector. The traces of the new particles formed during the collision are shown. The event may be exotic in nature. CERN's Large Hadron Collider (LHC) is back: the world's largest particle accelerator enters its second measuring phase at highest energies. In recent months, scientists and technicians have prepared the LHC to shoot significantly more particles at its limits than before and to process the huge amounts of data better. In 2016, for example, they want to provide about six times more collision events than last year. After the successful workshop of KCETA at SJTU in November 2015 we were particularly delighted that the president of SJTU made a return visit to KIT on March 8. On the program there were conversations with vice president Thomas Hirth, head of division Johannes Blümer and KCETA representatives as well as a KATRIN tour. Radio telescope LOFAR measures cosmic rays more precisely than ever – KCETA simulation code CoREAS is crucial for the determination of particle characteristics. "After ten years of research we understand the radio signals of these particle cascades so well that, by comparing detailed measurements with our simulation code we can make conclusions about the characteristics of the primary particles", reports Tim Huege, Institute for Nuclear Physics of KIT. At energies of 1017 to 1017,5 electron volt the latest results show a surprisingly high amount of light particles, protons and helium nuclei. "This raises questions", Huege says, who is also principal investigator of KSETA in the group radio detection of cosmic rays. The previous scientific spokesman, Prof. Johannes Blümer, took up his new position as Head of Division V on 1 October 2015. As a result of this change, the spokespersons of KCETA were replaced. Prof. Ulrich Nierste, who has previously served as deputy speaker, will focus on his role as scientific spokesperson of the Graduate School KSETA and prepare for the expected call for proposals in a follow-up programme to the Excellence Initiative in 2016. For this reason, the position of deputy spokesman had to be filled. At its meeting on 13 October 2015, the KCETA steering committee elected a new scientific spokesperson and deputy spokesperson. Prof. Marc Weber is the new scientific spokesperson and Prof. Dieter Zeppenfeld is the deputy spokesperson. Congratulations from KCETA to Takaaki Kajita and Arthur McDonald for being awarded the Nobel Prize in physics! In 2013 Takaaki Kajita received the Julius Wess Award from KIT. With this award KIT-Center KCETA honored his outstanding contributions to neutrino physics, especially his discovery of neutrino oscillations with the Super Kamiokande Detector. For this discovery he was now awarded the Nobel Prize 2015. In 2014 the PhD students of graduate school KSETA had the opportunity to listen to Takaaki Kajitas excellent laureate lectures at KIT and to discuss physics topics face to face with him. Research at KCETA is linked to the discovery of the two Nobel Prize laureates in several ways: Prof. Thomas Schwetz-Mangold does theoretical research on neutrino oscillations and determines the associated fundamental parameters of the data of all experiments of neutrino physics. While Kajita and McDonald showed, that neutrinos have mass, the physical quantity of this mass is still unknown. This question is the subject of the KCETA-experiment KATRIN, which will start measuring in 2016. Many former staff members of Arthur McDonald are members of the KATRIN-collaboration today. The world of particle physics is deeply saddened by the sudden death of Guido Altarelli on September 30, 2015. It lost one of its greatest scientists and leading theorists who has worked for many years at CERN and worldwide. The main emphasis of his work in theoretical particle physics was the interaction of particles within and beyond the so-called Standard Model that physicists use to describe elementary particles and the forces between them. His work has greatly influenced the field of particle physics, for which he was awarded inter alia with the Sakurai Prize (2012) and the EPS Prize (2015). Even to KIT he was connected in a special way: in 2011 KCETA appreciated the work of Guido Altarelli with the Julius Wess Award. Weight of 25 tons, length of 16 meters, and height of 4 meters: the tritium source for KATRIN arrived at KIT. It is the last component of the KATRIN experiment at Campus Nord, which will allow to measure the weight of the neutrino - the leightest particle of the universe. Installing the tritium source will take about six months and a lot of testing: 48 pedestals must be placed with an accuracy of fractions of a millimetre and 700 sensors will be tested. In the current funding period, KCETA's particle physicists will receive around 4.6 million euros for their research at the European research centre CERN. The BMBF is thus supporting the ongoing operation and further development work on the CMS detector, which contributed to the discovery of the Higgs boson in 2012. At KCETA, around 70 physicists work in 8 working groups on the operation, further development and physical data analysis of the CMS. The results of the first data collection period of the Large Hadron Collider (LHC) at CERN have recently been summarised in a book that was produced with the strong participation of scientists from KCETA. The book draws a comprehensive picture of the current state of physics on hadron colliders and summarizes the current results from the areas of measurements on the Standard Model of particle physics, the physics of the Higgs boson and the top quark, flavour physics and the results of the search for supersymmetric and other extensions of the Standard Model and also includes results from the analysis of heavy ion collisions at the LHC. KIT experts have contributed to four of the eleven chapters of the book: Matthias Mozer (Electroweak Standard Model), Klaus Rabbertz (Studies of Quantum Chromodynamics at the LHC), Günter Quast (Higgs-Boson Physics) and Ulrich Nierste (Quark-Flavour Physics). Iris Gebauer from KIT on the space experiment with which scientists have been investigating the properties of cosmic radiation for several years. The magazine "Bild der Wissenschaft" paints a portrait of the scientist and the KATRIN experiment. "Was macht eigentlich Astroteilchenphysiker Guido Drexlin?" On the occasion of the 300th anniversary of Karlsruhe, 300 people from Karlsruhe were interviewed by video about their life and work in Karlsruhe, including Professor Guido Drexlin. "They come from the sun and other stars, trillions of them rushing through our bodies every second: neutrinos are the least explored particles." N24 and Die Welt also report on neutrino research. The LHC stood still for more than two years. The teams from ATLAS and CMS used this time to prepare the two major experiments at the Large Hadron Collider for the upcoming operation with higher proton energies and collision rates. 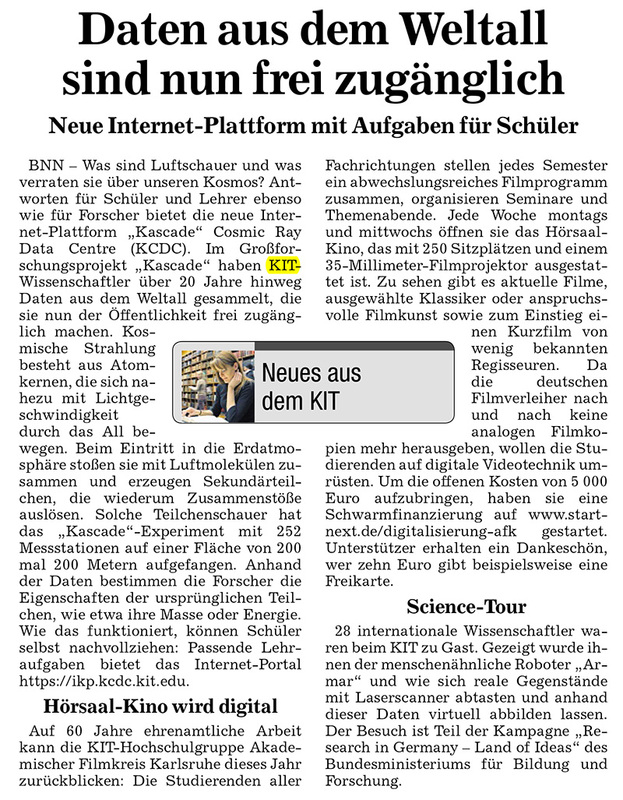 In "Welt der Physik" KSETA-PI Frank Hartmann writes about the preparations for the upcoming "Run". He is project manager of the silicon trace detector at CMS and responsible for the smooth operation, maintenance and upgrades of the pixel and strip detector. March 3, 2015 "PARTICLE FEVER – Die Jagd nach dem Higgs"
The German film and media evaluation has awarded the documentary "PARTICLE FEVER - Die Jagd nach dem Higgs" the PREDICATE "BESONDERS wertvoll". From the jury's statement: "The sensational event to which everything in this film is heading and for which the largest machine in human history was built for decades: International physicists want to find the "Higgs", also called "God particles", which gives all matter its mass. The images from the particle accelerator of the major scientific project CERN are overwhelming. Highly complex themes and theories must be brought close to the viewer, and it is astonishing how understandable the film is even for laymen in science. "Here we talk about the origin of the universe and the fundamental questions of existence." Congratulations to Margarete Muehlleitner (KIT) and all laureates for having been awarded Outstanding Referees of the APS Journals! The latest results of the measurement of high-energy particles with the detector AMS on the International Space Station ISS deepen our understanding of the origin and nature of cosmic radiation. A junior research group of the Karlsruhe Institute of Technology (KIT) under the leadership of Dr. Iris Gebauer is significantly involved in the experiment: She played a leading role in measuring the total flow of electrons and positrons. The spokesperson of the AMS project, Professor Samuel C. C. Ting, presented the results at the CERN Research Centre. Researchers from the Institute of Experimental Nuclear Physics (IEKP) at KIT, led by Professor Wim de Boer, were involved in the development and design of several components of the AMS detector. In 2011, the KIT set up the Young Investigator Group (YIG) "Cosmic Ray Transport Models for Dark Matter Searches with AMS-02" under the direction of Dr. Iris Gebauer to analyze the data. The YIG has taken the lead in measuring the total flow of electrons - negatively charged elementary particles - and positrons - antiparticles of electrons with opposite charges. The Young Scientists Workshop "Flavorful Ways to New Physics" will be held on Oct 28 – 31, 2014 near Freudenstadt in the Black Forest, 85 km away from Karlsruhe, Germany. These six lectures provide overviews of the main topics and are accompanied by talks of young scientists presenting their recent research. Furthermore, the informal atmosphere will lead to the opportunity of many discussions between the experienced researchers and the young scientists. We cordially invite you to participate and register at http://indico.scc.kit.edu/indico/event/flavor where you also can find additional information. Every participant who would like to present his own work in the area of flavor physics and related topics is invited to submit an abstract via the Indico page. The abstract can be submitted after the registration, by Sep 12 at the latest. Compatibility of Higgs boson couplings to vector bosons (V) and fermions (f) with the standard model expectation (diamond). Since the discovery of a Higgs boson by the CMS and ATLAS Collaborations in 2012, physicists at the LHC have been making intense efforts to measure this new particle’s properties. The Standard Model Higgs boson is the particle associated with an all-pervading field that is believed to impart mass to fundamental particles via the Brout-Englert-Higgs mechanism. Awaited for decades, the 2012 observation was a historical milestone for the LHC and led to the award of the 2013 Nobel Prize in Physics to Peter Higgs and François Englert. An open question arising from the discovery is whether the new particle is the one of the Standard Model -- or a different one, perhaps just one of many types of Higgs bosons waiting to be found. Since the particle’s discovery, physicists at the LHC have been making intense efforts to answer this question. This week, at the 37th International Conference on High Energy Physics , a bi-annual major stage for particle physics, which in 2014 is held in Valencia, Spain, the CMS Collaboration is presenting a broad set of results from new studies of the Higgs boson. The new results are based on the full Run 1 data from pp collisions at centre-of-mass energies of 7 and 8 TeV. The analysis includes the final calibration and alignment constants and contains about 25 fb-1 of data. The KCETA Symposium 2014 gave an overview of the activities of the KIT Center for Elementary Particle and Astroparticle Physics in the auditorium of the Advanced Training Center for Technology and Environment (FTU) at KIT Campus North. All KCETA staff, secretaries, technicians, scientific staff and professors were cordially invited: at a level understandable to all, scientific highlights and the discovery of the Higgs boson were reported and results of the KASCADE experiment and the search for dark matter were presented. Afterwards, the event ended with a meal together. More details about the program can be found on the event page. Prof. Takaaki Kajita (ICRR Tokyo), Julius Wess Awardee 2014, will give two lectures on the studies of atmospheric neutrinos on July 10 + 11, 2014 at KIT. The lectures will take place at KIT campus south Gaede lecture hall each day from 9:45 – 11:15 h. The lectures will be followed by informal discussion sessions in the afternoons from 13:30 – 15:00 h.
The first lecture will cover a review of the studies of atmospheric neutrinos until the discovery of atmospheric neutrino oscillations in 1998. On the second day Prof. Kajita will present various studies of atmospheric neutrinos that have been carried out so far and will discuss future investigations. Registration is required: http://indico.scc.kit.edu/indico/event/kajita-lectures . Congratulations to KSETA Fellow Carolin Heidt, who was dedicated the "DKV-Studienpreis" for her diploma theses at ITEP (KIT) by "Deutscher Kälte- und Klimatechnischer Verein (DKV)". What are air showers and what do they tell us about our cosmos? Answers for students and teachers as well as for scientists are provided by the new internet platform KASCADE Cosmic Ray Data Centre (KCDC). In the research project KASCADE, KIT scientists have been collecting data from space for 20 years, which now are freely available for the public. The Julius Wess Award 2013 was dedicated to Takaaki Kajita (ICRR Tokyo) for his outstanding contributions to neutrino physics and especially for his discovery of the neutrino oscillations at the Super-Kamiokande Detector. The top quark – the heaviest elementary particle known today – was the main focus of the TOP 2013 conference held in Durbach, Germany, on September 14-19, 2013. Participants from all over the world reported on the latest theoretical and experimental results on the physics of the top quark and discussed perspectives for the research field. Young physicists had the opportunity to meet world experts on top-quark physics in an informal atmosphere during a question&answer session. The conference program was complemented by a poster session in picturesque Staufenberg castle and by an excursion to the city of Strasbourg, France. The TOP 2013 conference was co-organized by KIT, DESY, and the University of Hamburg and supported among others by the German Research Foundation and the KIT Center Elementary Particle and Astroparticle Physics (KCETA). Scientists from the CMS experiment at the Large Hadron Collider (LHC) near Geneva announced a new measurement of the coupling constant of the strong interaction, ready in time for presentation at the international conference of the European Physical Society in Stockholm. The strong force, which is responsible for the binding of protons and neutrons inside of the atomic nucleus, becomes weaker in interactions at higher energies due to quantum corrections. This "running" of the strong coupling constant has been observed experimentally at different experiments, and was now measured for the first time at the highest available energies at the LHC. KCETA scientists have significantly contributed to these new measurements, which confirm the decrease with energy of the strong coupling constant, as predicted by the Standard Model of particle physics. Deviation would have been a sign for new physics originating from new particle in the quantum loops. The new measurements are consistent within errors with the earlier measurements. Simulated trajectory of a single trapped electron with start energy E= 1000 eV. Cover of the August issue of the Journal of Physics G.
The article "Validation of a model for Radon-induced background processes in electrostatic spectrometers" for the KATRIN experiment of freshly-graduated-of-today Dr. Nancy Wandkowsky is June 2013 'Publisher's pick ' of the Journal of Physics G. One of the picture of this paper (top picture on left) even made the cover of the August issue (bottom picture on left). First particle containing four quarks is confirmed. Physicists have resurrected a particle that may have existed in the first hot moments after the Big Bang. Arcanely called Zc(3900), it is the first confirmed particle made of four quarks, the building blocks of much of the Universe’s matter. Until now, observed particles made of quarks have contained only three quarks (such as protons and neutrons) or two quarks (such as the pions and kaons found in cosmic rays). Although no law of physics precludes larger congregations, finding a quartet expands the ways in which quarks can be snapped together to make exotic forms of matter. “The particle came as a surprise,” says Zhiqing Liu, a particle physicist at the Institute of High Energy Physics in Beijing and a member of the Belle collaboration, one of two teams claiming the discovery in papers published this week in Physical Review Letters 1, 2. Housed at the High Energy Accelerator Research Organization (KEK) in Tsukuba, Japan, the Belle detector monitors collisions between intense beams of electrons and their antimatter counterparts, positrons. These crashes have one-thousandth the energy of those at the world’s most powerful accelerator, the Large Hadron Collider (LHC) at CERN near Geneva, Switzerland, but they are still energetic enough to mimic conditions in the early Universe. Collision rates at KEK are more than twice those at the LHC, and they occasionally give birth to rare particles not found in nature today — ephemeral creatures that wink into existence for an instant and then fall to pieces. Some of that subatomic shrapnel matches what would be expected from the breakdown of a particle containing four quarks bound together: two especially heavy ‘charm’ quarks and two lighter quarks that give the particle a charge. With 159 of these Zc(3900) particles in hand, the Belle team reports that the chance that its result is a statistical fluke is less than 1 in 3.5 million1. “They have clear evidence of a particle with four quarks,” says Riccardo Faccini, a particle physicist at the Sapienza University of Rome. The new particle has also been vouched for by a second experiment, the Beijing Spectrometer III (BESIII) at the Beijing Electron Positron Collider. BESIII found 307 Zc(3900) particles, sifted from 10 trillion trillion electron–positron collisions 2. “This gives credence to all of the other particles that Belle has seen,” says Fred Harris, a particle physicist at the University of Hawaii in Manoa and a spokesman for BESIII. In 2008, Belle found another four-quark candidate 3 , and in 2011, it saw two other particles that may have been made of four ‘bottom’ quarks 4 — but no other particle colliders have confirmed those sightings. No one questions the number of quarks in the latest particle. More controversial is their arrangement, which could have implications for quantum chromodynamics, the theory describing the strong force that connects quarks. Theorists fall primarily into two camps. One side proposes that the particle is actually a union of two ordinary particles called mesons, which contain one quark and one antiquark. Zc(3900) particles could be made up of two mesons joined by a loose connection to form a molcule-like structure (see ‘Quark soup’). Other theorists have tentatively labelled the new particle a true tetraquark — four quarks stuck together tightly to form a compact ball. Within the ball, two quarks are bound together, as are two antiquarks. Such pairings do not occur in any known particle and would thus introduce new building blocks of matter — with the potential to guide computer simulations aimed at working out all the structures that quarks can form. Proponents of the tetraquark theory point out that a ‘molecule’ made of mesons should split easily into two halves, and that such a breakdown has not appeared in the data. “The signature of a molecule is not seen, which favours the tetraquark picture,” says Ahmed Ali, a particle physicist at DESY, Germany’s high-energy physics laboratory in Hamburg. But the experiments’ margin of error is still too great to rule out the possibility of molecular mesons breaking down. Another way to test the two theories would be to look for other particles that each predicts should exist. Hoping to end the debate, researchers at BESIII are continuing to dig through data collected since their first experimental run in December and January. Depending on what they find, the unmasking of Zc(3900) may have to wait for the new, more powerful version of the Belle detector planned to come online in 2015. The German astroparticle physicist Prof. Dr. Johannes Blümer, senior member of the Pierre Auger Observatory and spokesperson of the KIT Center Elementary Particle and Astroparticle Physics (KCETA ) was awarded Doctor Honoris Causa of the Universidad Nacional de San Martín (UNSAM ) by its rector Carlos Ruta in a ceremony that took place in Buenos Aires, Argentina. German and Argentinean scientists, academic authorities, professors and students were gathered to welcome Johannes Blümer, who was awarded the highest honorary title of UNSAM "for outstanding support and dedication to the development of astroparticle physics in the country, where he participated in major joint projects, and the training of international young researchers". Prof. Dr. Alberto Etchegoyen, director of the Institute of Technology and Astroparticle Detection (ITeDA ), Buenos Aires, and Helmholtz International Fellow, gave the traditional praise of honor. He mentioned the brilliant career of Prof. Dr. Blümer, his tremendous effort to develop astroparticle physics worldwide, and particularly in Argentina, and his devotion to teaching. He also highlighted his work as spokesperson of the Helmholtz Alliance for Astroparticle Physics (HAP ) and the close connection between the UNSAM and the Karlsruhe Institute of Technology (KIT ). Since May 2013 a dual degree PhD program has been set up between both universities. The event ended with a conference from J. Blümer “Big Science on a Small Planet", in which he explained how diverse is this area of study, which includes cosmic rays, neutrinos, dark matter, and described the work performed at the Pierre Auger Observatory, a project involving eighty institutions including ITeDA and KIT. The ceremony was followed by a two-day “German-Argentinean astroparticle workshop”, distributed between the Universidad Nacional de La Plata (UNLP ) and the Universidad de Buenos Aires (UBA ). On 4 July 2012, the two teams of the experiments from ATLAS and CMS announced the dicovery of the Higgs-Particle. Scientists have been looking for this particle for more than 40 years- it is the last piece missing to the puzzle with the name Standart Model of the particle physic. The field introduced from Peter Higgs in 1964, is connected with this particle and it spreeds in the all univers and is suppossed to grant this elementary particles in their mass. The High Energy and Particle Physics Price is given for outstanding contributions to elementary particle physics. The award ceremony takes place on the EPS HEP 2013 conference on 22 July in Stockholm. Researchers group in 16 universities. the Max-Planck-Institute for physics in Munich and the two Heimholtz research center DESY and KIT are working together on th two experiments. They are in particular focused in the BMBF research in FSP - 101 (ATLAS) and FSP - 102 (CMS). Morever they work together in the Heimholtz Alliance "Physics at the Terascale". The Instituto de Technologias en Deteccion y Astropaticulas ITeDA in Buenos Aires has joined the Alliance as Associated Member. In December 2012, ITeDa Director Alberto Etchegoyen was awarded one of the Helmholtz International Fellowships. This offers him the opportunity to pursue research visits of his choice and to visit the Helmholtz Managment Academy, where he will have the opportunity to ineract with the next generation of Helmholtz science managers.